I am starting my housing search but want to know if I need a mortgage in principle first as I hear conflicting things. Some people say I need one, including an estate agent I've just seen but I have also heard they are time limited and getting another one can affect my credit rating. What do you advise I do? An ‘agreement in principle’ (AIP), ‘decision in principle’ or ‘mortgage in principle’ are all terms that refer to much the same thing. A lender will take some basic information and perform a credit search and credit score before coming up with a figure that ‘in principle’ it would be able to lend. You should be able to get an agreement in principle for free, and some can be issued within a few minutes. Why should I think about getting an agreement in principle? Having a mortgage agreement in principle can help speed up the home-buying process, as you know how much you’re likely to be able to borrow. Having evidence of this also makes you a more appealing buyer, and will give a seller and their estate agent confidence that you’re serious about the purchase. A decision in principle is also useful for borrowers that are worried about meeting a lender’s eligibility criteria, because going through the initial checks early will give a sense of whether you’re likely to be accepted or not. If you’re rejected, it gives you the chance to reassess your financial situation before you start house hunting. However, it’s not compulsory to get an agreement in principle before you start looking for a house to buy. Another option is to discuss headline figures with a mortgage broker and get their advice. If the purchase – and your finances – look relatively straightforward, you could decide to wait until your offer is accepted and move quickly to make a full mortgage application instead. It’s important to note that if you’re looking to buy in Scotland, a mortgage in principle is often needed for an offer to be taken seriously. Getting an agreement in principle is relatively simple. Once you’ve compared mortgages and found the best deal, you need to request a mortgage in principle from the lender. You should be prepared to give information about your income and expenditure, and the lender will run a series of initial credit checks to see whether you are likely to meet their eligibility criteria. What if I don’t pass eligibility checks? If your first decision in principle is refused, it doesn’t mean that you won’t be able to get a mortgage with another lender – but it is important to understand why you didn’t meet the eligibility criteria. Ideally you would resolve these issues before you try again, because being in the strongest financial position increases your chances of securing the most competitive mortgages. If you can’t wait and you need to find another lender to issue an agreement in principle, a mortgage broker should be able to help. They will know which lenders are most likely to accept you, and may be able to steer you towards an acceptance. Your mortgage rejection may be down to a poor credit rating. If this is the case, see our guide on Mortgages for Bad Credit to understand your options. A mortgage in principle does not guarantee that your application for a mortgage will be accepted, nor does it make any guarantees about the amount that you can borrow. That’s because the initial credit checks are limited, so the lender doesn’t have a full view of your financial situation. Furthermore, the lender needs to make sure that your circumstances haven’t changed since the initial conversation. This is beneficial to buyers, too, because it doesn’t commit you to taking out a mortgage with the lender that offers the agreement in principle. You still have the option of investigating mortgage options further, if you wish to. How does an agreement in principle affect my credit score? To issue an agreement in principle, a mortgage lender will need to run a credit check. Most will do what’s known as a hard search, which is when the search is recorded on your credit report. This is important to understand, because multiple searches over a short period can be seen by lenders as a sign that you’re desperate for credit, which makes you a less attractive customer. Protecting your credit rating is essential when you’re applying for a mortgage, so you need to be careful that you don’t do anything to lower your credit score. 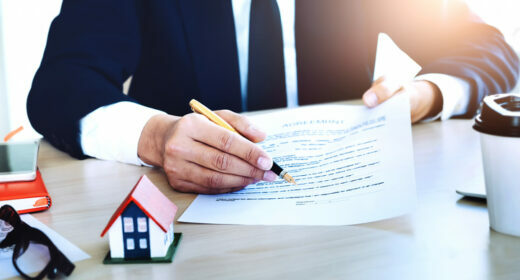 While one or two hard searches shouldn’t have an impact, getting multiple lenders to run credit checks to issue different agreements in principle will affect this negatively. You may be able to find a mortgage lender that will run a soft search, which is a credit check that doesn’t leave a record in your credit report. This is the most advisable option, but it may be hard to find a lender that does this – and it’s much more important to get a decision in principle for the mortgage you want, rather than try with a lender simply because they’ll only run a soft search. How do I get my mortgage confirmed? Once your offer has been accepted and you’re ready to arrange your mortgage, you need to go through the entire mortgage application process. How can I protect against rising rates?